Levels of NO2 in London are the highest of any capital city in Europe. But NO2 is not just a London problem. The UK has the highest proportion of zones exceeding the NO2 annual limit value plus margin of tolerance of any country in Europe. Cities affected outside London include Birmingham, Glasgow, Kingston upon Hull, Leeds, Manchester and Southampton and so-called ‘zones’ such as Eastern, East and West Midlands, North East, North West and Merseyside, South East, Teeside, The Potteries and Yorkshire. As an example of the scale of this public health crisis, annual mean levels of NO2 are averaging well over three times the World Health Organisation (WHO) guideline and legal limit in Oxford Street and are well over twice legal limits near many of our busiest streets. In proportion to the scale of this crisis, little or nothing is being done by the UK authorities including the Mayor of London. For example, evidence from the Mayor shows that exhaust emissions from passenger cars (including private hire vehicles) of NO2 and dangerous airborne particles (PM2.5) are expected to rise from 39% and 49% of transport emissions respectively in 2010 to a staggering 47% and 54% respectively in 2015.
to achieve substantial further reduction in health and environmental impacts in the period up to 2030. It also follows the Supreme Court judgment in May 2013 that ruled the UK is breaching NO2 limit values in 16 of 43 zones. The Supreme Court also referred ClientEarth’s case to the Court of Justice of the European Union (CJEU) for a ruling on next steps including ‘remedies’. Clean Air in London (CAL) understands the UK is the first of the 28 Member States in Europe to receive a ‘Letter of formal notice’ on NO2, perhaps as a direct result of the Supreme Court judgement. Today’s legal action also responds to CAL’s formal complaint to the Commission dated 15 January 2012 about widespread breaches of air pollution laws in London and efforts by the Government to mislead the Commission. A ‘Letter of formal notice’ is the first step of the formal five stage infraction process to enforce European laws. It is now often preceded by an EU Pilot ‘investigation’ that may last several months. Member States are typically given two months to respond to a ‘Letter of formal notice’ after which the Commission can send a ‘Reasoned opinion’ (final written warning). Two or more months after that the Commission can choose to refer the case to the CJEU for a ruling. Thereafter, if the Member State fails to comply with the CJEU’s ruling, the Commission can return to the CJEU seeking lump sum and daily fines against the Member State. Mayor Johnson has estimated these fines could total £300m per annum per pollutant for London alone. 1. The obligation to achieve compliance with the limit values includes the obligation to maintain such air quality status once compliance is achieved (Article 13, first paragraph). 2. With the only three exceptions listed in Annex III (Section A, paragraph 2), limit values must indeed be complied with throughout the territory of any given air quality zone, and compliance should be not be determined nor assessed as an “average” of concentrations measured in different locations within the same zone. 3. Unlike target values, which create an objective to be achieved “where possible” or “where not entailing disproportionate costs”, limit values create an obligation of result which is unconditional and absolute, irrespective of costs (Article 2, paragraphs 5 and 9). 4. Where air quality is already good, Article 12 of the Directive applies. This provision spells out in legal terms the “non-deterioration” principle, according to which Member States shall not only maintain the levels below the limit values, but also “endeavour to preserve the best ambient air quality compatible with sustainable development”. This clarification confirms that Mayor Johnson has repeatedly misunderstood the requirements of Directive 2008/50/EC including during the removal of the western extension of the congestion charge and in his plans for the Olympic Route Network. CAL is therefore publishing today the Commission’s excellent, timely and authoritative letter and will be drawing it to the attention of the Mayor, the Government and others. The Government and the Mayor have downplayed the health impacts of NO2, failing to mention that it is the only ‘modern’ molecule within the whole gaseous component of air pollution subject to WHO guidelines and legal limits. Whereas the particle component of air pollution is regulated by its total mass concentration, gases other than NO2 are largely ignored. It is vital therefore that levels of NO2 are reduced to avoid: its direct health effects and those of other toxic pollutants from combustion; and its contribution with nitrogen monoxide as a precursor to the formation of deadly particles. Sulphur dioxide, which is also regulated, has been largely eliminated as a problem by the use of ultra-low sulphur fuels. The WHO classified diesel exhaust carcinogenic to humans in June 2012 and outdoor air pollution and particulate matter as carcinogenic to humans in October 2013. A state of the art report by the WHO earlier last year said “Many studies have documented associations between day-to-day variations in NO2 and variations in mortality, hospital admissions, and respiratory symptoms. Also, more studies have now been published showing associations between long-term exposure to NO2 and mortality and morbidity. Both short- and long-term studies have found these adverse associations at concentrations that were at or below the current EU limit values, which for NO2 are equivalent to the WHO Air Quality Guidelines”. Last September, another leading group of scientists said there is evidence for a long-term effect of NO2 on natural mortality as high as that of PM2.5 which has long been considered the most dangerous air pollutant. Diesel vehicles and gas heating and cooking, together increasingly with new local sources of combustion, are the main sources of NO2 in London. Policy Exchange has estimated that diesel vehicles are responsible for 91% of dangerous airborne particles (PM2.5) and 95% of NO2 exhaust emissions from road transport in London. 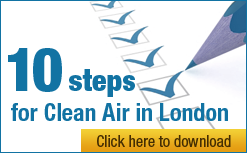 The Mayor estimates that 82% of NO2 emissions in London are generated within the city. In summary, NO2 laws are the most powerful tool citizens have to hammer down carcinogenic diesel exhaust and other toxic pollutants from combustion. “Europe at its ‘best’ is taking legal action against the UK at its ‘worst’ on air pollution. “Clean Air in London (CAL) congratulates Commissioner Potočnik on the European Commission’s Clean Air Policy Package announced on 18 December at the end of the ‘Year of Air’ which prioritised full compliance with air pollution laws throughout Europe by 2020 and reductions of the most harmful emissions by 2030. CAL has wanted the Package to be backed by early infraction action and binding emission limits in 2025 and so today’s announcement of infraction action commencing is very welcome. “Commissioner Potočnik was right to delay legal action on nitrogen dioxide (NO2) while ClientEarth’s case was progressing to the Supreme Court and the Clean Air Policy Package was being negotiated across Europe over nearly three years. He was also right choose to enforce not reopen the Directive on ambient air quality and cleaner air for Europe (Directive 2008/50/EC) in the Clean Air Policy Package, despite overwhelming health evidence showing the need for tighter air pollution laws, given the UK and some European cities and regions were actively lobbying for the existing laws to be weakened. Some mistook last December’s announcement to mean infraction would begin not end in 2020 but today’s news confirms they were wrong. Member States and cities need to understand they will be paying fines (or perhaps Ministers and Mayors should face jail?) from 2020 if they do not comply with these public health laws. “In many ways the Government’s failure to address air pollution mirrors its failure to prepare for flooding. Free market anarchy, caused by having no constraints on money-making, will always lead to public health and environmental catastrophes. “The Mayor has also been at fault. In particular, his refusal for six years to take action to reduce harmful pollution from passenger cars means its proportion of deadly pollution emissions is forecast to grow by a staggering 20% between 2010 and 2015. Almost as bad, his claims of reductions in concentrations and computer modelled emissions are misleading at best. Transboundary or background levels of NO2 have reduced, no doubt partly or entirely due to two or three years of heavy rainfall, while the London component of regulated concentrations (i.e. what we breathe) appears to be relatively unchanged over many years. Last but not least, the Mayor has also misunderstood Directive 2008/50/EC and is irresponsible to say “natural justice demands that authorities should only be held accountable for the things it can do” seemingly ignoring that he has the powers and influence necessary to reduce air pollution. 5. warn Londoners during smog episodes to reduce hospitalisations, save lives and build public understanding of air pollution. “All of these measures need to be backed by real-world testing of emissions and the best scientific evidence. “In this context, the Mayor’s repeated backward steps and lack of ambition for his so-called ultra-low emission zone by 2020 and other measures look ridiculous or worse. Action to restrict diesel passenger cars must be an urgent priority not least within an ultra-low emission zone within the area bounded by North and South Circular roads. No-one wants fines but the end of any [five stage] enforcement process must have a final sanction of fines or jail (for Ministers and/or Mayors) and the UK will deserve them at this rate. Note: Four zones exceeded the NO2 annual limit value but obtained limited time extensions. Government claims Marylebone Road had the highest exceedances of NO2 at an annual mean of 94 ug/m3 Tab 11 when far higher levels were recorded at other locations e.g. Putney High Street (155 mg/m3) and Oxford Street. 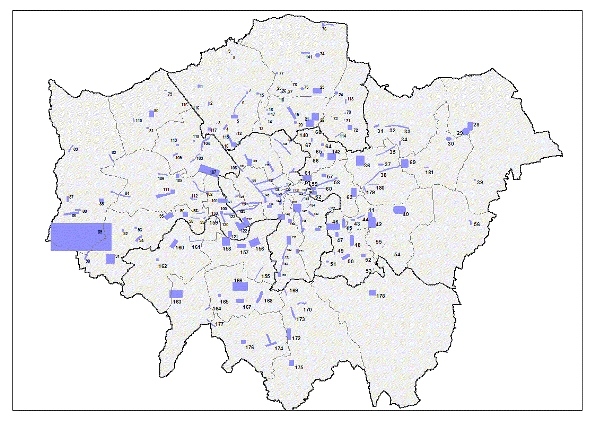 The Government’s own report shows annual average concentrations of NO2 have not declined during the last 10 years at eight long-running traffic urban sites that include Bath Roadside, Camden Roadside, Glasgow Kerbside, Exeter Roadside, Haringey Roadside, London Marylebone Road, Oxford Centre Roadside, and Tower Hamlets Roadside) (Figure 5-6 on page 43 of the full report).